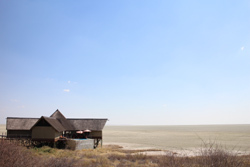 At Onkoshi Camp you are not only inside the fabulous Etosha national Park with all its wildlife and splendid nature but you also get the breathtaking vista over the Etosha pan itself something unique to Onkoshi Camp. 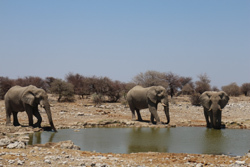 Located in the north east of Etosha close to Fischers Pan the Namibia Wildlife Resorts run Onkoshi Eco Camp will stun you with the sights smells and sounds of the tranquil beauty of the Etosha Pan, its vastness spreads out before you extending an amazing flat panorama far beyond the horizon, during hot days you can see the heat shimmering off the surface, dramatic colours accompany every sunrise and sunset and the clear night skies show off Namibias celestial display of shining stars in all thier beauty.. remember to wish on any shooting stars you may spot! 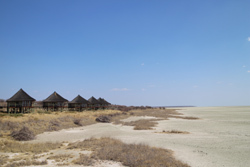 The Onkoshi Camp is an exclusive, low impact environmentally friendly semi-permanent, up-market lodge on the eastern edge of the Etosha Pan, on elevated wooden decks. 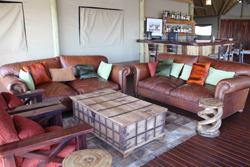 With only 15 private chalets and a maximum of 30 guests at any one time Onkoshi offers a more peaceful tranquil stay than any of the other camps in Etosha, the small restaurant and bar area spill out onto a lovely large decking area that looks directly onto the Etosha Pan perfect for sundowners and sunsets. 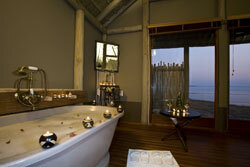 There is also an infinity swimming pool overlooking the pan. Guests arrive in Namutoni from where they will be transported to Onkoshi Camp in NWR vehicles. 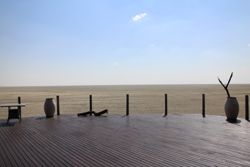 The site is on a secluded peninsula, and offers a full view towards the west, overlooking the immense saline pan. 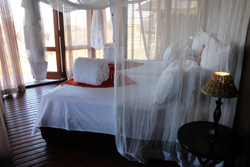 The location is entirely out of view of current tourist routes, and offers a pristine, tranquil and unique experience to its guests. 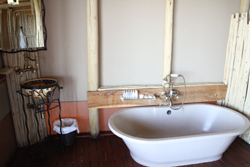 All rooms are spacious and en suite each with an Indoor and Outdoor Shower, a stone bath tea and coffee station, evening turndown service and each has a breathtaking view onto the pan. 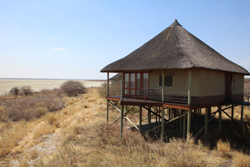 Chalets are built on elevated wooden decks, with thatched roofs, insulated canvas walls and large, wooden-framed retractable doors allowing spectacular panoramic views. 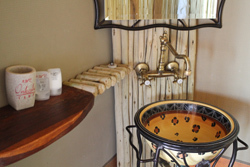 Rooms are tastefully equipped with locally crafted fittings and furnishings, using a combination of metal and wood combined with natural fabrics to create a natural and ethnic ambiance. 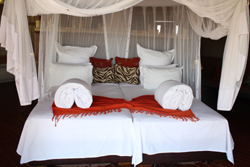 Each chalet at onkoshi has two ¾ beds, except in the honeymoon chalet where a king-size bed will be provided. Space for luggage and hanging space is provided, and a sleeper couch in all but the honeymoon chalet, will allow for accompanying children, however no children under the age of 6 will be permitted. 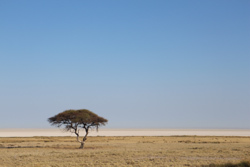 In line with NWR’s environmental policy, each unit is energy self-sufficient, entirely from solar energy, including the water heating, lighting and power point for charging electronic equipment. 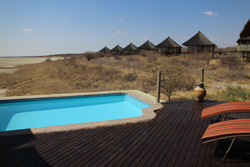 One of the primary attractions of the lodge is the proximity to the pan, with its shimmering mirages during the hot days; dramatic sunset and sunrise textures and colours; sense of isolation and space; clear night skies; and the sights, smells and sounds of untamed and unadulterated Africa.